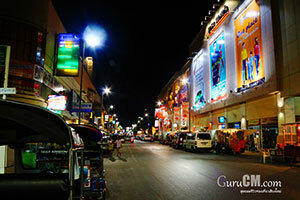 Night Bazar and Kard Anusan it comes to shopping nightlife. This could be the biggest attraction of the cityThere are souvenir shops as well as stalls. And is located in a shopping center or commercial buildings. There is also a restaurant and pub. Which is popular among foreign tourists. There is also a pub and restaurant, which is popular with foreign visitors. Here is a colorful , bustling quarters from evening until midnight. Location Chang Klan Road in the City. Interest The Night Bazaar There are hundreds of shops lined along Chang Klan Road from intersection to intersection downtown light clothing, bags, shoes, jewelery and leather goods brand of clothing, including a tie. Counterfeit goods And crafts. The product of Kad Anusan. It looks similar but cheaper and easier to negotiate. Calibrated with Thailand Massage helps relieve fatigue. From walking a socket Thailand, China, Western, Islamic and restaurant outlets. Applied arts Add method of producing a quality product more eye-catching. So it can be used as jewelry or souvenirs. And also produced clay pots and blenders for mixing.